I've been freelancing up in Minneapolis and have switched my exercise routine to the morning because I never know when I'll get done at night. Early in the morning, I go to my little 24-hour gym in the bottom of the Thrivent Financial building. Today something happened TWICE that really upset me. As I was sweating it out profusely for the sake of my body's birthday gift to me of bra fat, I watched a woman walk by with a donut and coffee in her hand. As she walked by, she swiped her access card through the reader on the door so that the system registered her as accessing the gym. And then she walked down the hall, eating her donut. She did not need the donut. She did need the gym. A lot of insurance companies now offer incentives in the form of rebates if you go to the gym a certain number of times a month (anywhere from 8-15 times per month), so I'm sure that was what she was doing. I kind of laughed it off. BUT THEN. (There's usually a "but then" for me). But then, another woman walked by and swiped her card through the reader without stepping foot in the gym. And she walked right into the greasy spoon breakfast restaurant next door to the gym. She also needed the gym more than the greasy breakfast. I'm not going to lie. I got pissed. I'm not even talking about the fact that there's an obesity epidemic in America. I'm talking about the CHEATING by swiping the card through the reader so you get credit for making an attempt to take care of your health and fitness while you're actually destroying it with donuts and greasy breakfast foods. It might be okay if you ate the food and intended to exercise later in the day, but those ladies are clearly swiping their card without any intention of exercising and it makes me really, really irritated. I make exercise a part of my life for many reasons. One of the main reasons I exercise is because it has eased a predilection towards anxiety and depression to such a degree that I have been able to eliminate medications that address those problems. Exercise and eating healthfully (most of the time) *are* my medications. And, of course, I exercise to stay in shape so that when I do eat that donut or greasy breakfast occasionally, I feel okay about it. I guess at the end of the day I know those ladies are really only cheating themselves. In the future, that $20 a month rebate they took while eating donuts and grease is not going to be such a good deal once they have heart disease and require surgery and long stays in the hospital. 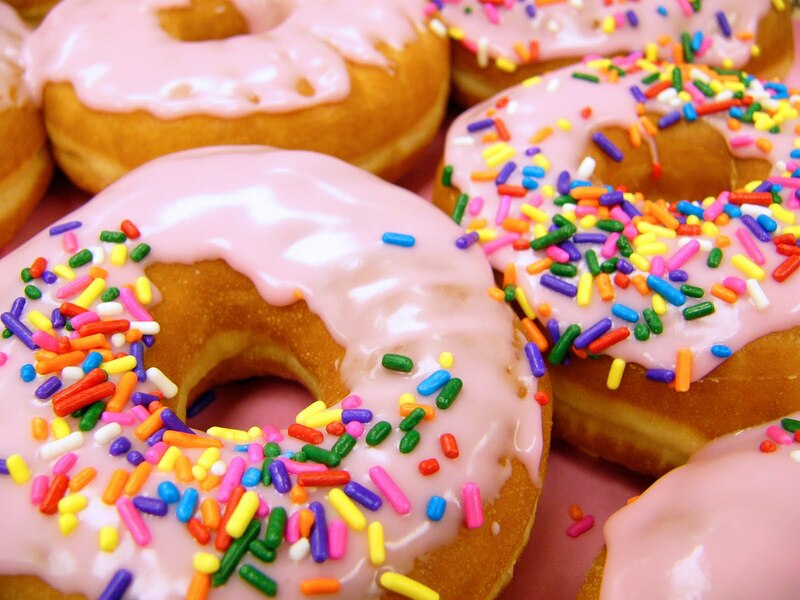 *I love donuts. My faves are Dunkin Donuts with strawberry icing. **While looking for a photo for this post, I found Superdonuts, which only have 180 calories per donut and 5 grams of fat. This makes me angry and I'm not even there!